Here are my birthday people! Aren’t they great? I don’t think they even spoke to me until 9:30 0r so today. Playing, playing, playing! This morning they noticed that the new toy dragon had a red tip on his tail. Blood. What do you do when you have a bleeding injury? Band-Aids! I found them under a table in the living room – one tail bandaged successfully, thirty seven (or so) failed attempts stuck to the floor, little papers blowing like tumbleweed through their western village. Honestly, I just can’t imagine why I don’t get more done around here! Oh, my! They are simply adorable! I love the looks on their faces. Cutest lil’ cowpokes I ever done seen. Great cowboy clothes and love the band-aid story! Happy Birthday to the cowpokes! I love pictures like that. Their faces say it all. 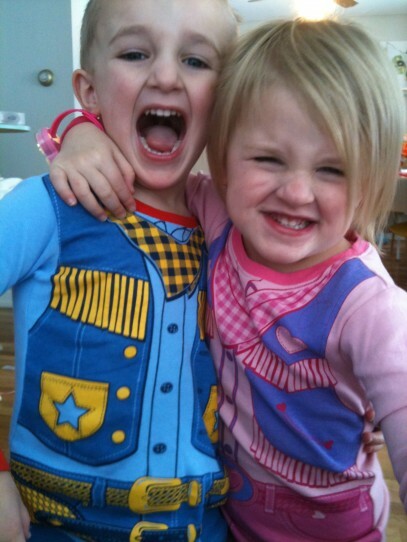 I got the twins the jammies at the Gap….a month or so ago. I couldn’t resist! Very cute and oh so happy looking! A fantastic shot! I love the joy and exuberance! Might not be getting as much done as you hope, some days – but oh what fun memories! Claire, no idea what size you’re looking for, but there are lots (NWT) on eBay, Here are two… http://bit.ly/hGjXWe and http://bit.ly/gLQydx . I went hunting but they only come in baby / toddler sizes and I needed beast sizes, lol.